With a 5 star food hygiene rating we are specialists in providing home cooked traditional food to everybody including the elderly and housebound. Delivered hot to your door and served on a plate! 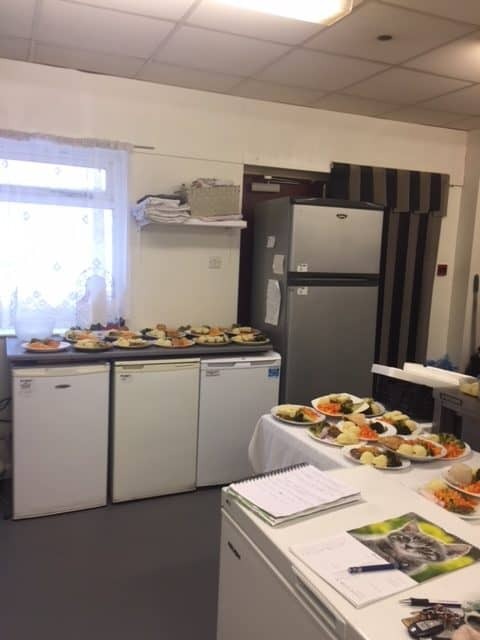 A family run business established since 1999 that prides itself on good traditional cooking delivered direct to your door on a dinner plate, we do our utmost to cater for all dietary requirements, we are highly recommended by social services and healthcare agencies. We offer a varied selection of salads including quiche, ham, cheese, prawn, tuna or cold meats. We offer Hot and cold meals either standard or small, there is a varied selection of main items to choose from that are accompanied by vegetables of the day with mashed potato or boiled potato’s and a pot of gravy. Alongside our main meals we also offer fast food options such as fish , burgers, sausages, nuggets, pies all served with chips, wedges peas or beans. Hopefully you can find the answer to your questions here, otherwise please feel fee to contact us with your questions about our service and we will get back to you soon! What is you kitchen food hygiene rating? We operate to the highest standards for your quality and safety. Our kitchen has a 5 star rating! Our delivery times are between 11.45am and 1.45pm each day except Sundays. We will deliver your Sunday meal on Saturday. What areas does your delivery cover? Our current delivery area is North & South Lowestoft, Pakefield, Carlton Colville, Kessingland, Southwold, Beccles, Gorleston, Great Yarmouth & Hopton we will expand to suit within reason, if your area is not listed please contact us to discuss your requirements. No, we have been cooking delicious, wholesome food serving the Lowestoft area since 1999. We have over 18 years experience serving hot food on a daily business, even in the snow! Have your delivery drivers been CRB checked? All staff have been CRB / DBS checked for your security. All of our drivers wear a security badge to identify them. You can see an example of the badge on meet the team page, plus you can see photos of all of our staff so that you are familiar with their names and faces. Do you cover dietary requirements e.g. Gluten Free / Diabetes? Yes we do cater for special dietary requirements. Gluten Free, Vegetarian and Diabetic and we will cut/chop meals if requested. Can you please explain how I can order my meal? Orders are placed usually on a daily or weekly basis by Phone or via delivery drivers (there is an answering service out of hours to take orders) orders need to be made the day before delivery or by 8.30am on the day. I need to cancel my meal, how can I do this? Just give us a quick call, All cancellations need to be made before 8.30am on the day of delivery to avoid being charged. Payment process options are cash or cheque on delivery to the drive or by bank transfer, customers may pay daily, weekly or monthly in advance. Do you deliver to everybody? Originally the focus was on elderly & housebound but we now pleased to deliver to anyone of any age or ability, even working professionals who wish to save time cooking! How are your meals served? All meals are delivered on a plate covered by foil, hot or cold, plates are left until the following delivery where they are collected by delivery driver. At present I am happy not to require a deposit for plates. Do you cater for customer meal request? We are open to customers requests and will try to accommodate at all times, please ask at point of ordering and we will try to accommodate your request. What about Bank Holidays and Christmas delivery? Yes we do cover meals over Bank Holidays & Christmas etc, we close for approx ten days over Christmas for which we offer frozen meals delivered prior to closing, we close for two days over Easter (Good Friday & Easter Monday) again frozen meals are provided and the same for Bank Holidays (Frozen meals provided) customers are informed prior to holidays to give notice via flyers and telephone calls. We would love to answer any questions or discuss your dietary requirements. Please feel free to call us at our office on the left or send us an email using the form below. Special Offer New Customers - Save 20% when ordering a full weeks menu!